Good morning to you and I hope you are having a nice time. As for me, I am not having a nice time and you know why? It's international break. Gosh! Close to two weeks without seeing Arsenal in action is something I can't cope with so easily but what can I do? I'll just have to wait. Right about now we will be taking a look at some happenings around our club. In as much as there isn't so much to report at the moment, we still have a few, some of which you may already be aware of. Let's begin with a disaster we suffered recently. When will Welbeck return from injury? I do not know, neither does the club who feel it is too early to give a precise time for his comeback considering the severe nature of the injury. Who knows? He may never even appear in an Arsenal shirt anymore. His current contract expires at the end of the season and he may have played his last game for Arsenal if he won't get a new one. The condition of the 27-year-old hindered him from joining the rest of his national teammates on international duty this week. They however showed some love by paying tribute to him with a picture of him placed beside their TV as they watched on Wednesday night. 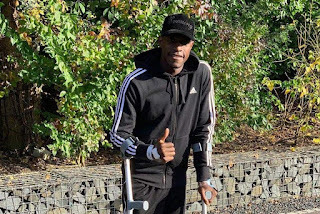 Our thoughts are with Welbz and we hope and pray he overcomes this battle and return in good shape. Wishing him a speedy recovery. Elsewhere, we have seen reports claiming that our own soon-to-be-out-of-contract Aaron Ramsey could be an Allianz Arena faithful soon as Bayern Munich have shown interest in him. The Wales international was left alone when talks over a new deal did not yield any positive result and as understood by Sky Sports Germany, he could hit a pre-contract agreement with the Bundesliga champions in January - clubs outside the English Premier League are allowed to sign players from the league when they are in the final six months of their contract. Ramsey told us last month that he knew not the reason behind Arsenal's withdrawal from contract negotiations but vowed to put in his best while still at the club. Some are stil of the opinion that anything can still happen at the last minute. I agree too. Lastly is an update having to do with world football clubs and their wage bill look. A ranking was done yesterday and Arsenal (€232m) emerged number 10 on the list of teams with the highest wage bills. Barcelona (€487m) were first, followed by Real Madrid (€395m) while Manchester United (€337m), Manchester City (€296m), Chelsea (€256m) and Liverpool (€241m) were 3rd, 4th, 8th and 9th respectively. That places Arsenal on number 10 in the world and number 5 in the English Premier League, A number of English clubs like Arsenal, Chelsea, Liverpool, Leicester, Tottenham were ranked based on their 2016/17 financial records. Please note that this is not a 'richest clubs in the world ranking' but one that shows how much every club spends to pay its players annually. Okay! That will be all for now. See you next time and please do well to drop your comments below. We will love to hear from you.